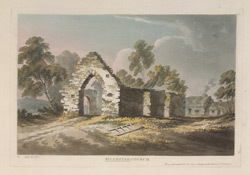 View of the ruins of Killester church in Ireland. Killester is located in Coolock in County Dublin. The area is sometimes known by it’s Irish name ‘Cill Easra’ which means ‘the Church of Esra’ which infers that someone called Esra either built the church or gave land for this purpose. Later the church was dedicated to St Brigid of Kildare as it was believed to hold a relic of the saint.